The most stressful wonderful time of the year is here! 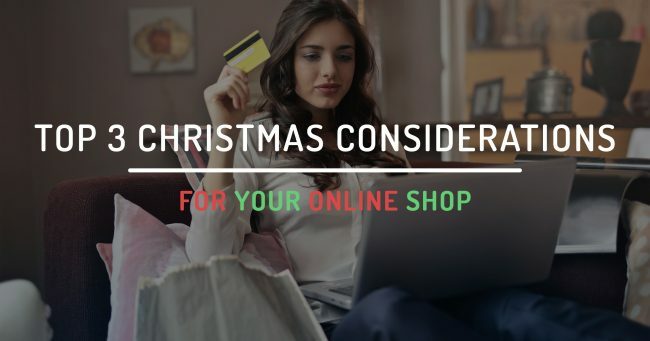 As we head into December and the ultimate shopping season of the year, we present you with our top 3 considerations that may be worth implementing in your online shop. If you have a website that processes a significant number of e-commerce transactions, having a real-time backup system in place could save you a huge amount of stress should anything ever go wrong. Typical backup systems will run on a daily, weekly or monthly basis. This is all well and good until (touch-wood) that dreaded moment in time where you realise your website has been compromised and you need to roll back to a previous backup point. If your backup point is quite old, this will mean that any orders you’ve processed between that backup point and the current time will be lost from your shop’s records after you roll back. Having real-time backups in place massively reduces the amount of data loss you may face in this unlikely (but unfortunately very real and very possible) circumstance. It doesn’t have to cost you a fortune either. Real-time backups are offered by ManageWP for $6 USD per month. They’re also included in Jetpack Professional (which includes a whole suite of other tools and functionality) for $299 USD per year. With more people shopping online now than ever before and no stopping in sight, a great way to maximise your online sales is to start capturing and rescuing abandoned carts. Every year, it is estimated that trillions of dollars of goods are abandoned in the cart. Have you ever been shopping on a website and added a few things to the cart before feeling a wave of uncertainty? Or perhaps you became distracted by something else, only to have eventually forgotten about it and closed the website? There are all kinds of reasons for people to abandon a shopping cart full of items, but it doesn’t always mean that all is lost. Emailing your would-be customers an hour or two after they abandon their cart with a special offer or a discount code can be just the tipping point they needed to come back and seal the deal. If you are using WooCommerce, they offer their own guide and plugin for handling abandoned cart emails, though this isn’t your only option by any means. There are several abandoned cart plugins built for WooCommerce and various other checkout systems. Some good options to check out would be Abandoned Cart Lite or Abandoned Cart Pro by Tyche Softwares, or YITH WooCommerce Recover Abandoned Cart. In this world, nothing can be said to be certain, except death and taxes and expensive postage fees. If you have an online store that ships physical goods, postage costs are probably one of your larger expenses. If you charge a flat shipping fee in your online shop, you may be finding yourself chipping into your profit margins a little more often than you’d like depending on what every individual customer orders. There is another option to protect yourself and ensure that your customers are paying the exact amount of postage that they should for the goods they order. Australia Post offers a shipping cost calculator plugin, which when installed will calculate the exact postage you will pay based on the dimensions and weight of the items in the customer’s order. It will then present your customer with the shipping costs and different shipping options, such as regular, registered or express post, allowing them to pay extra if they want to get their order expedited. The plugin also allows you to add an extra base fee to all shipping fee calculations, to cover things such as packaging materials, handling time costs and transport costs to and from the post office. This ensures postage fees will never eat into your well-earned profits and gives the customer a variety of shipping options and speeds to pick from!